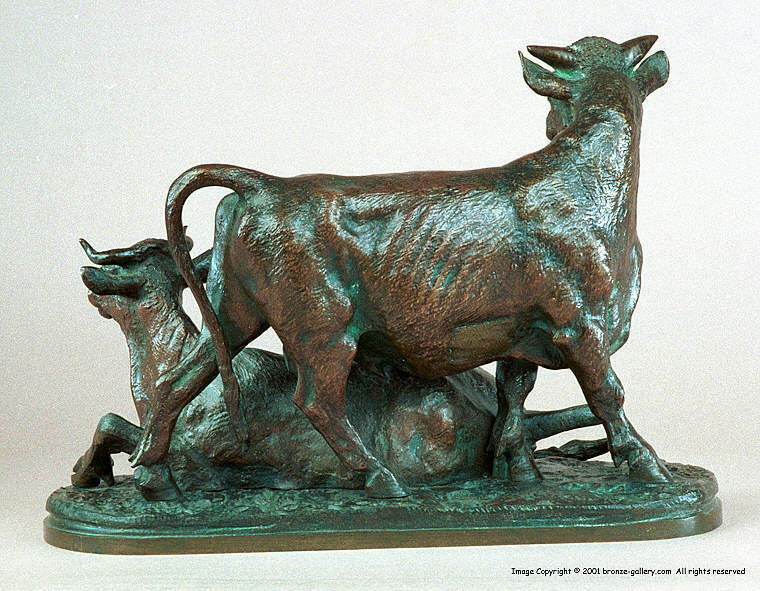 Here is a large finely detailed sculpture of a Bull standing over a Cow. Fratin sculpted a variety including models of domestic animals. In the mid 19th century domestic farm animals were very common and these subject were quite popular. This peaceful sylvan scene is in stark contrast to Fratin's violent combat sculptures. Whether portraying domestic tranquility and harmony such as he has accomplished in this bronze or the raw violent world of nature, Fratin was a master sculptor who captures the pure essence in all of his subjects. 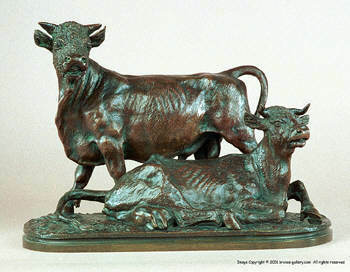 This bronze is finished in a rich red brown patina and bears the artist's personal cold punch stamp as well as his signature, showing that he was personally involved with the casting process of this fine bronze A cast of this model is illustrated in Payne's book Animals in Bronze on page 171.